Traditional beauty secrets and recipes for home made beauty enhancement pastes have been handed down over the generations . The age-old methods used by Indian women to get a flawless and glowing complexion are 100% Home made natural Face Masks For Glowing Skin. Spices and other kitchen ingredients are not only for making delicious food but also to get a beautiful and radiant skin. Store bought skin care products are expensive and are laced with chemicals which can cause long term damage to the delicate skin. 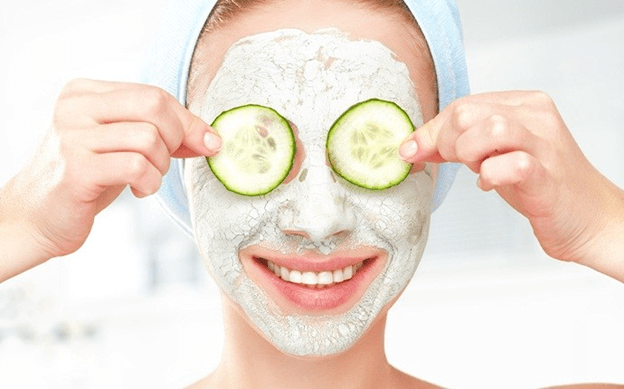 The most common and effective way of doing it is by preparing face masks at home using kitchen ingredients that are replete with skin-benefiting antioxidants and essential vitamins that can do wonders for your skin. What is in your soap? So, if you’re looking for natural ways to help your skin get a glowing complexion, then we’ve got you covered. The following masks are considered to be the best face masks for glowing skin. So, pamper your skin with these miraculous face masks to impart a radiant glow on to your skin. See out top list below. Aloe vera is an all-purpose natural ingredient that comes with a host of benefits for the skin. It is a source of powerful antioxidants that can help your skin get rid of the dead skin cells and get a glowing complexion. Plus, you can easily combine it with different ingredients such as lemon, tomato pulp, etc., to create a homemade face mask for glowing skin. Simply scoop out a tablespoon of gel from an aloe vera plant and mix it with a teaspoon of lime juice or tomato pulp. Gently apply it all over your face and leave it on for 20 minutes before rinsing it off with room temperature water. Both, cucumber and lime juice are packed with vitamin C that can effectively impart a radiant glow on your skin. Using them in combination is an age-old beauty trick that Indian women have used since ages to get a glowing complexion. Grate half a cucumber and mix it with a tablespoon of fresh lime juice. Gently smear this face mask on your skin and allow it to stay there for 15-20 minutes before washing it off with room temperature water. Gram flour is known as ‘Besan’ in Hindi and is one of the most treasured natural ingredients for skin care purposes. It is a powerhouse of skin-benefiting antioxidants just like raw milk. That is why, this particular face mask is often cited as the best face mask for glowing skin. Take a teaspoon of gram flour and mix it with a tablespoon of raw milk. Gently apply the resulting glowing and brightening face mask all over your skin. Leave it there for 10 minutes before cleaning with water. Egg is a great source of astringent properties and almond oil is packed with vitamin E. Both these ingredients combined together can help your skin get better in every sense possible and also help it regain its natural glow. Mix 2 teaspoons of almond oil with an egg and slather it all over your face and neck. Let this glowing and brightening face mask settle in your skin’s surface for at least 20 minutes before washing it off with tepid water. Turmeric, aka haldi, is a true favourite ingredient for treating all kinds of skin problems such as acne, dull skin, etc. It is a powerhouse of antibacterial agents just like baking soda that can do a lot of good to your skin. Mix 1 teaspoon of turmeric or most commonly known as haldi powder for face with half a teaspoon of baking soda and 1 tablespoon of rose water. Then apply this homemade face mask all over your skin and wash it off after 10 minutes to enjoy an instant glow on your skin. All the three ingredients: turmeric, honey and milk are enriched with antibacterial properties that can remove dead skin cells and bacteria from your skin and help it regain its natural glow. Use organic turmeric powder for the face to reap maximum benefits. Take 1 teaspoon of it and mix it with 1 tablespoon of honey and 1 teaspoon of milk. Mix and apply the mask all over your face. Rinse with tepid water after keeping the mask on for 15 minutes. Banana is one fruit that is widely used in India for skin care purposes. It is a powerhouse of skin-enriching nutrients and vitamin B16. Combining it with honey, which is replete with antioxidants, is a traditional and effective way of getting a glowing skin. Just mash a ripe banana and add a tablespoon of honey to it. Stir them up properly and apply the resulting mask on your face. Allow this homemade face mask to settle in your skin for 10-15 minutes before washing it off with room temperature water. Papaya is packed with papain, an enzyme that can benefit your skin in numerous ways. Blending this amazing fruit with honey, a great source of powerful antioxidants, can help your skin fight off dullness. Cut a few pieces of a ripe papaya and mash them up using a spoon. Then mix it with a tablespoon of honey and smear it all over your face. Leave this glowing and brightening face mask on for 20 minutes before washing off with room temperature water. Both, cucumber and watermelon are replete with vitamin C and other skin-reviving agents that can help your skin eliminate dead skin cells. Using both these ingredients together is another simple yet powerful way of getting a glowing skin. The skin-brightening nutrients present in both, breadcrumbs and malai (cream), can do wonders when combined together. This is another skin mask for glowing skin that is worth having a go at. Mix a handful of breadcrumbs with 2 teaspoons of malai and smear the resulting mask all over your face and neck. Let this face mask stay on for 20 minutes before cleaning with tepid water.